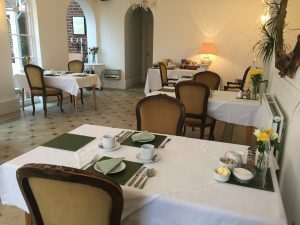 Breakfast at Aylestone Court is served in the light and bright Garden Room from 7.30-9.00am Monday to Friday and from 8.00-10.00am at weekends. Our buffet breakfast includes fruit and juices, yogurts and cereals which you can enjoy while your traditional cooked English breakfast is being freshly prepared for you. We use as much local produce as we can, sourcing our sausages and bacon from Herefordshire Meats and our eggs are free range. Want more time to sleep? 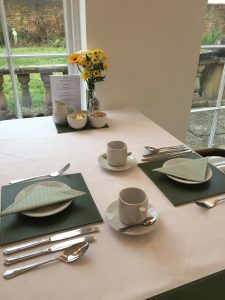 Why not arrange a breakfast-to-go where we will have a bacon roll, sausage sandwich or any other portable breakfast (!) ready for your to take with you on check-out. An early breakfast can be also arranged – please ask on check in. 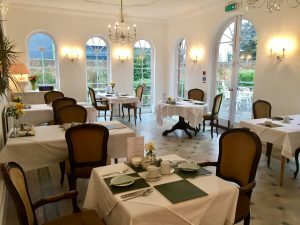 Our lovely Garden Room is large enough to accommodate external breakfast bookings so if you are looking for somewhere different to kick-start your day, why not book your table now for a breakfast meeting or just a catch up with friends.